Let me guess. You just finished all of the difficult, time consuming steps of a DIY divorce in Bexar County, Texas. You turned in your decree to the guy at the desk and you asked when you can expect to finally get the divorce done with. He gave you a knowing look and told you it would be a while–You realized you were going to have to wait 4-8 months or worse to get your divorce done. But, you were told you don’t have to wait if you get a lawyer. And that is where we come in. 4. You and your spouse created your own divorce decree, using your computer or some divorce form service. 5. 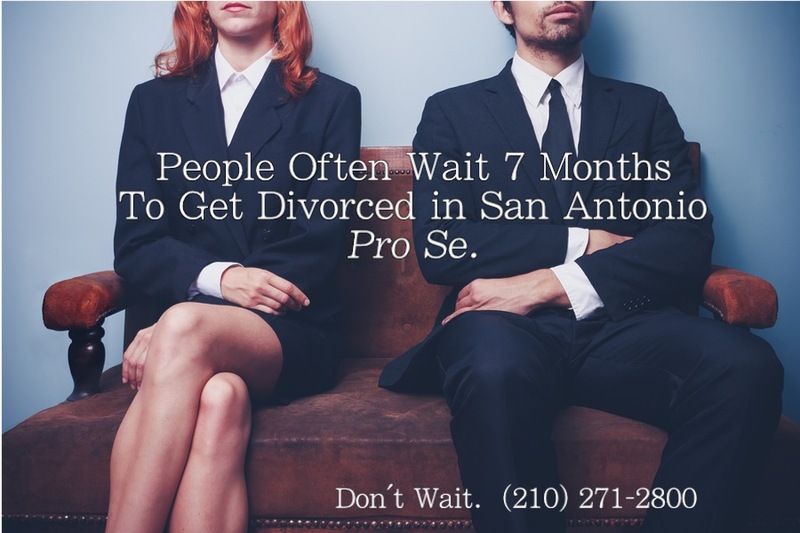 You found out the waiting period in San Antonio to get divorced is too long, and now you want to a hire a lawyer to make the process go faster. Great! We would be happy to help you. If your 61 day waiting period (the time since your filed your petition for divorce), has already passed, we can get you divorced in 1-2 weeks! This offer only applies through October of 2014, and is specifically for people who meet the above 5 conditions. Note, that this package does not come with additional customized drafting into the contents of your decree. If upon investigation into your case, we learn that you need specialized drafting such as child support withholding orders, or qualified domestic relations orders, we will advise you of this fact, and give you the opportunity to purchase the additional drafting service. One appearance in court to finalize the divorce. PURCHASE MY DIVORCE COMPLETION SERVICEIf you have questions about getting a lawyer to finish your divorce, call us at (210) 271-2800. TERMS OF SERVICE: Cook & Cook Law Firm, PLLC preserves the right to decline to render this service, if upon investigation into the divorce case, the Firm finds for any reason that the case should not be accepted. Do You Need a Lawyer to Do the Entire Uncontested Divorce Process? Go Here. Article offers patrons the ability to hire a lawyer inexpensively, simply for the limited scope service of finishing a San Antonio Uncontested Divorce. The cost of divorce $1000-1,500, the the waiting period is 1-2 weeks after 61 days have passed since the filing of the petition.